The hilltop setting treats you to unobstructed vistas over the water. Adjust the lounger to its just-right angle, pull out your book and lose all track of time - well, until you start getting questions about lunch. With views like this, you won't want even a pane of glass between you and the breezy ocean air. It'll feel even more like home once the kids start leaving goggles and dive sticks here and there. It's the best kind of multi-tasking. The resort has a game room with a television, board games and ping pong. Book a tee time at Makai Golf Course - a 4 minute drive from the resort. Way up high on a bluff on Kauai’s north coast, overlooking pristine Anini Bay, the Wyndham Shearwater is one big panoramic view-fest. Enjoy breathtaking vistas from nearly every window, and even the cliffside pool and hot tub. Got an active crew? Check out the schedule of onsite activities for the kids, and have them circle their favorites. Between games and contests, park yourself poolside near the Keep Away game in the water – you may be called upon to play ref to keep things fair. Even non-golfers will want to give the neighboring courses a whirl, for the incredible scenery alone. (Be thee warned: this could be the start of a lifelong hobby.) Try The Woods Nine at Makai Golf Club, winding your way through the wooded course. If you need something a little more cardio-intense, ask about jogging routes near the resort. Then book a massage for later. Surrounded by lush, well-maintained gardens, the two-bedroom condos are just over 1,300 square feet, sleeping up to six island explorers (with no one relegated to sleeping bags on the floor). Each residence has a private balcony with stunning views, ideal for morning coffee or evening drinks and card games. Once the sun disappears and you’ve lost your view until morning, head inside for a movie, or let the soccer fans go at it over a fierce FIFA match. With popsicle requests by day, and quickly-disappearing popcorn by night, you’ll want to keep the full kitchen well stocked with snacks. Once things wind down, load up the dishwasher and make your escape to the jetted tub once everyone’s settled in for the night. You’re just a few miles from Hanalei Beach Park, on the famous two-mile stretch of white sand beach surrounded by mountains and waterfalls. Pack a picnic, sand toys, masks, fins, and plenty of sunscreen and make a day of it. Or head for Princeville Ranch Adventures for zip-lining, horseback riding, kayaking and off-roading. Want to see even more iconic island sights? Hike the massive Waimea Canyon, dubbed the Grand Canyon of the Pacific by Mark Twain. Or Instagram your way through Waikapalae and Waikanaloa caves. Visit a former sugar plantation, go mountain river tubing, or get really crazy and take an island helicopter tour. Kauai is home to some of the world’s best golf, with ten courses, including signature designs by Jack Nicklaus and Robert Trent Jones Jr. Take a lesson with a pro, or round up a foursome and conquer your course of choice. And don’t miss the chance to experience a classic luau like the Polynesian Feast at Smith’s Tropical Paradise Luau (best on the island). 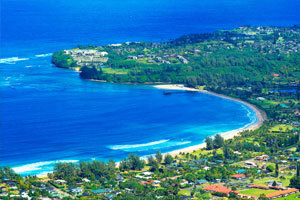 - The front desk is located at Ka Eo Kai Resort at 3970 Wyllie Road, Princeville, HI 96722. It is open 6:00 AM-10:00 PM Friday-Saturday and 6:00 AM-12:00 AM on Sunday. Guests that are planning to arrive after hours can check in with security located in the lobby. For more details please contact the property using information on the booking confirmation.